One of the key signatures of Netflix's You, other than all that cyberstalking and murder, is Joe Goldberg's omnipresent voiceovers. 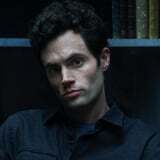 The character, played by Penn Badgley - who would still like to make it crystal clear that Joe is NOT hot, OK?! - narrates much of the show the same way he does in Caroline Kepnes's book, upon which the drama is based. "Who are you? Based on your vibe, a student. Your blouse is loose. You're not here to be ogled, but those bracelets, they jangle. You like a little attention. OK, I bite . . . you're not the standard, insecure nymph hunting for Faulkner you'll never finish. Too sun-kissed for Stephen King. Who will you buy?" His inner monologue only gets creepier from there, serving to shape the series from his point of view. But what you might not realize as you make your way through the show is that without Joe's near-constant, scathing observations about Beck, Peach Salinger, and the rest of the city, You actually ends up being very awkward. To prove this, Netflix went ahead and removed Joe's voiceovers from a few scenes and compiled them into one cringe-worthy highlight reel that made my soul curl up and die from secondhand embarrassment. Like that "eight-second" scene wasn't already awkward, right? I never thought I'd say this, but I'm now so, so thankful for Joe's nightmare stream of consciousness. Fingers crossed it brings us all more witty (and murderous) gems in season two.